There are three kinds of baked sweets I can recall from my packed lunches as a kid – my mom’s homemade muffins, strawberry newtons and fig newtons. When it came to the newtons, the strawberry ones made sense to me, but I thought fig was a made up flavor. I had never seen or eaten a fig before. Last week I had my first taste of fig and played in the kitchen with them. They look so beautiful photographed. When figs started showing up at my local grocer this season, I took them home on a whim. Not sure what to make with them, they sat overnight and were spoiled by the next day. Fragile little things, they are. Determined to try them, I sketched out a jam recipe adapted from Tasty Yummies. As I cut and prepped the figs, I nerd-ishly explored their flavor and scent profile. The resulting jam was tasty. After popping it in the fridge, I had dreams of cinnamon rolls and honey plum jam dance in my head all night. 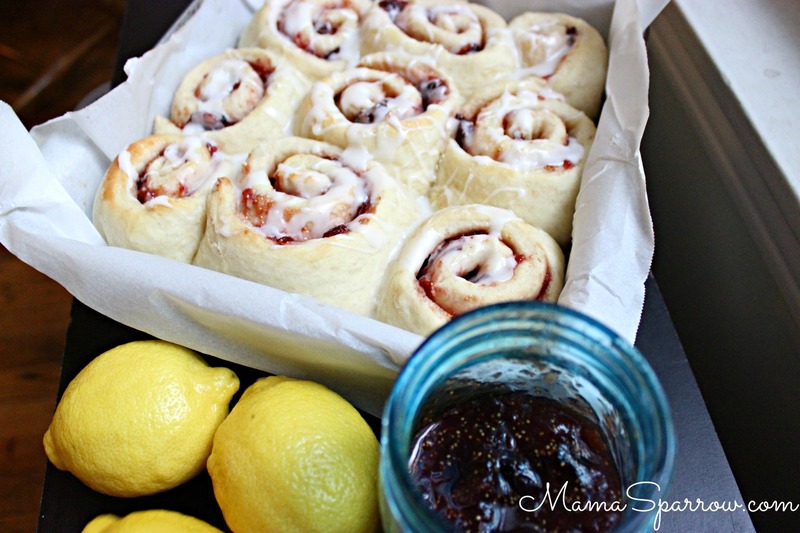 Honey fig jam tucked into blanket-y sweet roll dough and drizzled with velvety lemon frosting. Prepare the jam. The recipe makes 2 cups. Only one is needed for the rolls so make two batches of rolls, make a second batch of rolls soon or use your jam for other goodies. Mix all the dry dough ingredients together in a medium size bowl. In a microwave safe bowl, combine the water, milk and butter. Heat for 45 seconds, or until the butter is melted. Stir the wet ingredients into the dry mix. Stir the egg in. Knead the dough for 4 minutes. Dough should get smooth, have a bit of grip and bounce. Rest the dough in a lightly greased bowl for 5 minutes. After the dough has rested, roll it out on a lightly floured surface into a rectangle about 9x15 inches. Spread the melted butter over the dough. Then spread about 1 cup of fig jam over top the butter on the dough. Leave 1 inch without jam on one of the long sides of the rectangle; this will be the seam. Starting at the long, not seam side, begin rolling the dough jelly roll style. End the log roll with the seam side down. Use a sharp, floured knife to cut the log into 9 sections to make rolls. Place rolls into a 9x9 inch pan lightly greased and covered with greased parchment paper. Cover the pan with aluminum foil. Turn off the oven and place the covered pan of rolls in the oven to rise for 20 minutes. After rising, remove the aluminum cover from the rolls and leave in oven while turning on to 375 degrees F. Bake 16-20 minutes until the rolls just start to get golden. Remove from oven and top rolls with drizzle. To make frosting, combine sugar and lemon juice in a bowl. Whisk together and add in warm water to adjust consistency and taste. Place figs, honey and water in a medium saucepan. Let sit and soften for 20 minutes. Then place over burner on medium-high heat. Bring to a boil for 3 minutes. Reduce to low and keep on a simmer for 45 minutes. Stir often. Mash figs with a spoon while they cook. After 45 minutes, keeping pan on the heat, stir in lemon juice and zest. Simmer an additional 3 minutes. Remove from heat and allow to cool. Place cooled jam in jars. Store in the refrigerator for 3 weeks or the freezer for 3 months. Today is the first day of preschool for my oldest. I just dropped him off. The flood of emotion hit me strongest as I walked away from the school pushing my littlest bub in a stroller. I’m excited for him to enjoy this milestone. I’m also anxious for him to be comfortable and confident in his new environment. Fear is another part of this complex of emotion. Having a child with a food allergy makes trusting him in someone else’s care unnerving. The last feeling has only been heightened by the rawness of an serious reaction he had at a family potluck a couple of weeks ago. While sending him off to school, several questions are bouncing around my mind. Will he inadvertently be offered food he shouldn’t have? Will classroom staff recognize a serious allergic reaction? Will he always be with someone who knows how to use his EpiPen? I have worried of being perceived as neurotic and rude. Naturally, it feels like a hassle to insist on reading the label oneself, inquire about the ingredients, ask if someone has washed their hands, used a different knife, if toys have been cleaned etc. I can only speak from the experience I have had and understand that my experience may not be the same as yours. Perhaps this all does sound crazy to you or perhaps you may be able to relate. I am fine with either reaction. Today I am sympathetic of all parents sending their children off to school. Extra hugs go out to parents of children with allergies. All this talk of emotion needs a little comfort food, I think. 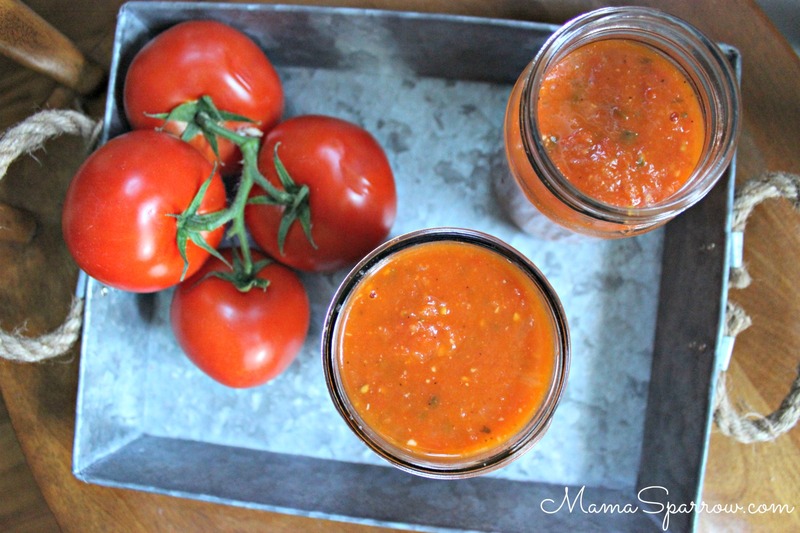 I am sharing a tomato basil sauce that is versatile and capitalizes on the peak season of tomatoes. The sauce is nice and light if made by the recipe. For a “meatier” version, toss in a bit of fennel seed. This sauce can been made in bulk and stored in the freezer for later use in the coming months. If you have the chance to this sauce, please photos and tag mama_sparrow on social media. I would love to see how you use the sauce in your home. Enjoy! Fresh stove top roasted tomato sauce with fragrant basil, oregano and marjoram. Enjoy on your favorite noodles, vegetables or pizza. Preserve in the summer to freeze and enjoy through the winter. Warm the olive oil in a medium saucepan over low heat. Add onion, garlic, marjoram, salt, pepper and optional fennel seed if using. Saute for 3 minutes. Add the tomato paste and stir to incorporate. Stir in the tomato, turn heat to high until it simmers. Reduce the temperature to medium and simmer uncovered for 10 - 15 minutes. Remove pan of sauce from heat. Pour into food processor and blend till desired consistency. Add in the herbs and pulse a couple of times until they are incorporated. Serve sauce immediate or store. May be kept in refrigerator for 4 days, 3 months in a standard freezer or 6 months in a deep freezer.